Developers can’t wait to demolish, re-build, increase density, add more offices, shops, cafes and restaurants in Fitzrovia. They can’t help it: it’s in their nature. But will it be the noise of the building works, the crush of shoppers, or the smell of grilled food wafting through the narrow streets that turn people off a successful neighbourhood better known for its variety of uses and interesting streetscape? In the first of a three part feature, Peter Whyatt maps and photographs Fitzrovia’s craters and development sites, while Linus Rees describes the major landowners. University College London Hospital. UCLH have a long history of knocking the neighbourhood about and had owned a number of sites on both the Camden and Westminster sides of Fitzrovia. With the advent of the new hospital on the Euston Road they consolidated their estate around the north eastern part of Fitzrovia. In their wake they left a huge crater along the Camden and Westminster border where the much-loved Middlesex Hospital once stood, and have had controversial plans for the former Strand Union Workhouse halted by the current government. But in due course they will submit revised plans for a development on the workhouse site. They have other sites they may hang on to or sell off. University College London Estates. Own sites containing research, academia, student residences and have redevelopment plans. Consortium of Aviva Investors, Exemplar, and former Kaupthing Bank. 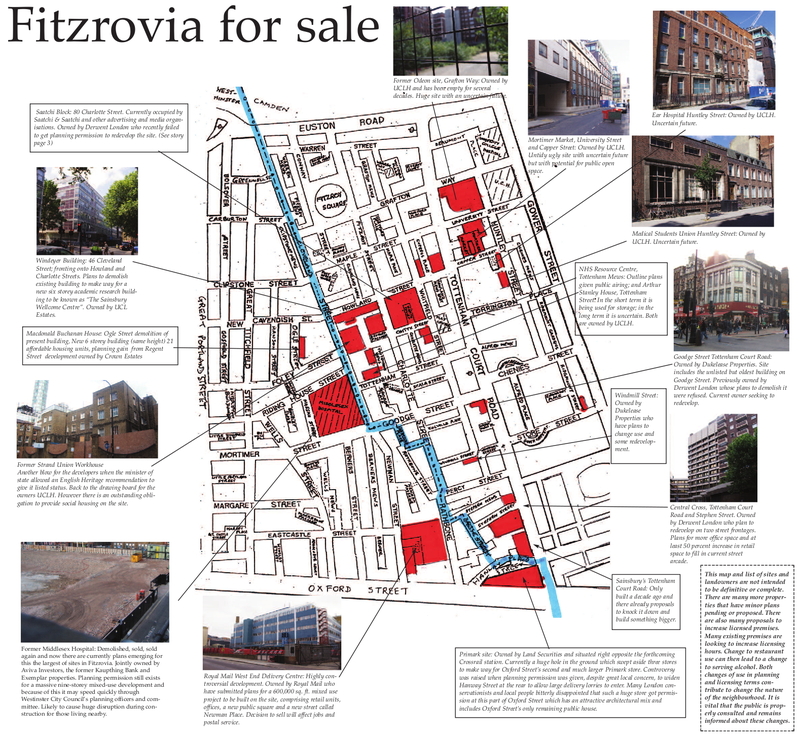 Looking to build on the largest crater in Fitzrovia, the former Middlesex Hospital site. A public exhibition of development proposals is forthcoming and a planning application is likely to be submitted in the autumn this year. The building works will cause a lot of noise and other disruption for residents surrounding the site. Land Securities. The biggest commercial property company in the UK own large chunks of Fitzrovia including Oxford Street frontages. Likely to compete with Derwent London and Great Portland Estates for more property. Possibly looking to acquire the Royal Mail Delivery Centre in Rathbone Place. Derwent London. Own large amounts of office space with some retail and looking to increase both. A lot of recent activity with buying and selling property in Fitzrovia. Lost the battle to redevelop the Saatchi block but shouldn’t be underestimated. Highly ambitious with plenty of money to hand, have plans to increase density and return on their current Fitzrovia property, and have suggested pedestrianising streets. They have a stake in the New West End Company business improvement district (BID) and are backing the Fitzrovia Partnership which may apply to become a BID in the near future. Possibly interested in buying the Royal Mail Delivery Centre when it becomes available, but will have to fend off Land Securities. Fitzrovia is very important to them according to recent statements from their CEO John Burns. The company pleaded viability concerns to Camden Council recently but in March Burns told shareholders the company had the ability to acquire higher rental incomes on both their office and retail properties. The Bedford Estates. Recently re-furbished part of Store Street and brought in new tenants. Currently completing a redevelopment on the former petrol station on Ridgmount Street. Own much of south eastern part of Fitzrovia around Bedford Square.